Explore the archeological ruins of Copán, a UNESCO World Heritage-listed site of the Mayan Empire, on this full-day trip from Guatemala City. Head by comfortable coach on a relaxing drive to Honduras, and enjoy a 2-hour guided tour of the ruins with a knowledgeable guide. You’ll learn about the Yax Kuk Mo dynasty through its temples, elaborate stone monuments and hieroglyphic writing system, as well as fascinating artifacts excavated from the site! In the early morning, meet your driver upon pickup at your Guatemala City hotel and board your comfortable coach for a scenic 6-hour drive to Copán. Along the way, stop for a complimentary Guatemalan breakfast, including beans, eggs and tortillas or bread, and enjoy the company of like-minded travelers. 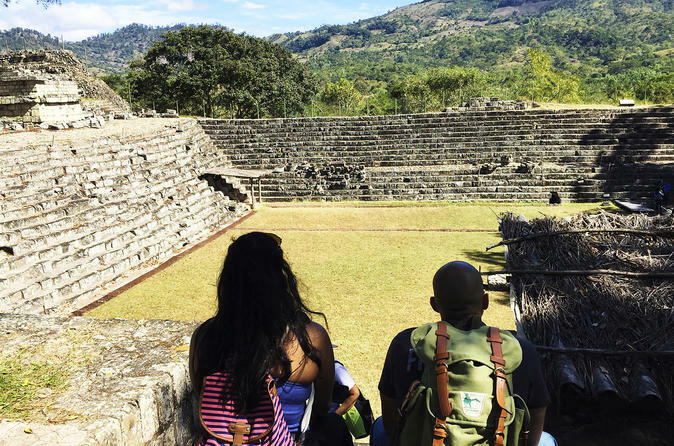 Once your group crosses the border into western Honduras, it’s only about 37 miles (60 km) to Copán, the country’s most impressive archeological site. This ancient city of the Yax Kuk Mo dynasty dates back to the 7th century and was known as Xukpi by the Mayans. When you arrive, you will meet with your guide and take a 2-hour tour of the UNESCO World Heritage-listed site and explore the incredible stone sculptures, altars and temples with your expert guide, who will point out the five main sections of the city. See the Great Plaza, the Acropolis, the ball court and hieroglyphic stairway, and even visit the underground tunnels if you choose. Walk around two enormous plazas that divide the Acropolis, housing several significant temples and altar. Your guide will describe how these monuments, as well as Central America’s second-largest ball court, were used. In the Great Plaza, observe the intricate design of the scattered stelae – sculpted stone monuments 9-16 feet (3-5 meters) tall, which chronicle Mayan rulers of the empire! Climb the 63 steps along the hieroglyphic stairway and view the detail of several thousand carved glyphs, the longest text of the ancient Mayans ever to be discovered. Visit the on-site museum and see the excavated artifacts on display, or walk through the archeological tunnels underneath the Acropolis to view earlier stages of the immense Mayan Empire (additional fee). Afterward, your guide will take your group to Copán Ruins, a nearby colonial town also known as San Jose del Copán, where you can purchase lunch. Then, relax on the return by coach, arriving at your Guatemala City hotel around 7pm.